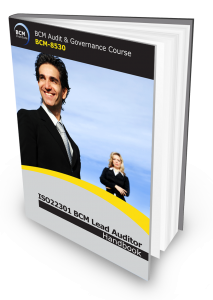 This is an advanced level ISO 22301 Business Continuity Management Systems (BCMS) Audit course with a 150-Multiple Choice Question (MCQ) based examination, following the successful completion of the course. This workshop is primarily designed for senior BCM professionals with audit responsibilities, system auditors and /or lead auditors to conduct audit/ assessments based on the ISO22301 Business Continuity Management System. As a qualified BCM Auditor or Lead Auditor, he or she is to decide on behalf of the clients on the compliance and effectiveness of the audited organisation’s business continuity management system in meeting ISO22301 requirements. Participants who successfully attended the workshop and successfully completed the certification examination (with a 75% passing score) on the morning of the 5th day will be able to apply for certification as Business Continuity Certified Lead Auditor (BCCLA). BC Certified Lead Auditor (BCCLA) Certification is awarded to participants who successfully completed and passed the Qualifying BCCLA examination attached to the course, sends in an application detailing at least 1 year of BC experience , make the application processing fee payment of SGD150 and satisfies and meets the experience requirements of the independent certification body. Have good understanding of the ISO22301 Business Continuity Management System and its requirements. This course incorporates a 150-Multiple Choice Question electronic exam the next day. The duration of the examination is 3 and 1/2 hour. Candidates who achieve with a passing score of 75% or higher are eligible to apply for the BCM Institute’s Business Continuity Certified Lead Auditor (BCCLA) accreditation. The examination fee is included as part of the course fee. Attendees who are not citizens of the host country will pay the full fee for the courses.